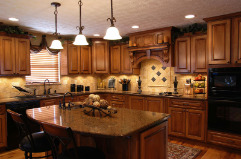 Phase 4 Contracting has years of experience modernizing and remodeling homes. 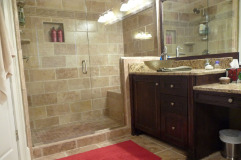 We can handle everything from a complete remodel of your current kitchen or bathroom, to a simple upgrade. We can install new appliances and cabinets, new fixtures, new paint, and give you a completely updated look for your home. We also handle any cleanup and removal of the existing fixtures, and are happy to provide examples of possible new fixtures, paint colors, appliances, or anything else you may need. We will guide you through every aspect of the project to make your house one step closer to your dream home. Our process is very simple and straightforward. Its starts with an initial phone call, and leads to our free estimate. When you initially call us, we will have a brief conversation about the project. Once we know exactly what room you are looking to remodel, along with some basic details, we will book an appointment for an initial consultation. Our initial consultations are often done within the first 24-48 hours after we hear from you. In the beginning we want to fully inform our customers of the wide range of options in products and materials that are available to them. At this stage we want our clients personal taste to guide the project. Your kitchen, or bathroom will be used by you every day for years to come, and we want you to be happy with the final product. For customers looking to be less hands on, we typically provide three basic options to choose from. These options are based on what is currently popular, trendy and of course, what fits their budget. We will have our product expert with us during the estimate and consultation meeting to demonstrate and showcase products for you to choose from, but our Phase 4 installers will actually do the installation of each project. During our consultation we will discuss all aspects of the project with you, from beginning to end. This will include new paint, toilets, shower doors, tub, vanities, or any other desired features. We will demonstrate products if necessary and offer suggestions based on your wants and needs. We will install any product or item even if not purchased through us with our standard workmanship warranty if you have something very specific in mind. Our estimates all include an allowance to account for upgrade or change requests during the project. For example, if you must have a different tile, or a particular fixture, we have some room to work it in. We are always happy to work with you on any change requests and adjust the budget accordingly. Once you have reviewed your choices we will give you a time frame estimate on how long the project will take from start to full completion, and how long the area will be out of commission, and it can vary. Every project is different, but in the case of a complete rebuild with a kitchen, we will tarp off the designated area that we are working in to allow you to still have full use of the rest of your home during the project. Tarping the area does mean you will not be able to use the kitchen or bathroom during the project, but it keeps most dust or debris confined to the job site. This keeps you safe, and allows for us to leave your home completely clean. A complete rebuild generally takes approximately 2-10 days from our initial consultation to final completion, depending upon the size of the kitchen or bathroom. This includes all work and final cleanup. As a rough time frame this estimate is based on easily sourced materials, but we do not want you to feel confined by only what is easily available in the area. This time can be increased by certain factors. Issues such as if we are custom building cabinets, or using prebuilt ones, and how available are certain colors are vital to providing you an accurate estimate of time. If we need to wait for custom materials to be delivered, this can increase the time frame. The good news is this extra time is often based on when we can assume delivery of custom items. Once Phase 4 knows exactly what your custom “wants” are we can update our timeline to give you an better idea how long the project will take. 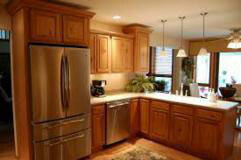 Your new kitchen or bathroom remodel is limited only by your budget and your imagination. Each consultation ends with us providing you an informational packet that includes a list of our services, a full list of our credentials including our licenses and insurance, and a list of references. We encourage you to research any potential contractor, and want our customers to feel our reputation for quality and attention to detail is well earned. Our references will be happy to tell you of their experience with us. With our experience in the industry, once we know your specific material needs, we will deliver a quote very quickly. These quotes are typically completed in about 24-48 hours. Sometimes in less than a day, or even at the consult appointment in some cases. We do not believe in a one size fits all material quote. We work directly with our suppliers to find the best price on the necessary materials for every quote for standard work. With custom work we are happy to look into sources for your desired materials. Our quotes are good for a period of at least 30 days, but after that material costs may have changed, or may no longer be available. However, if materials are still available we will make every effort to maintain our estimates within a reasonable time frame. We work quickly to complete your project as our goal is to have your home back to normal as soon as possible. We will offer you general information on all of the materials we are recommending, including any warranty, and expectations of durability and lifespan. Our customers can let us handle everything for them, or you are free to purchase the necessary materials based on our estimates independently. Our customers are free to source their own materials if they are looking for something we do not normally carry. Keep in mind manufacturer warranties can differ based on the exact materials used, but we always offer a standard workmanship warranty of at least one year on all of our work even if the materials were not provided by us.